Since opening in 1993, the Rees Jones designed layout at Falcon's Fire has been regarded as one of the most desirable courses in the greater Orlando area, and with the 2009 completion of brand new TifEagle greens, the conditioning of this classic layout will be better than ever. The Rees Jones Signature Design features some splendid holes and a beautiful golfing canvas, and can be stretched over 7,000 yards. 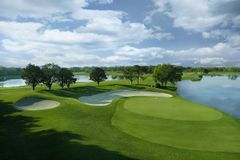 A number of prestigious professional events have been staged at Falcon's Fire, whose closing nine holes wraps around two huge lakes, creating a stunning and challenging setting for a round during any good Orlando golf holiday experience.